Mario Kart 64 is the second installment of the Mario Kart series. It is the first game in the series to use three-dimensional graphics; however, the characters and items in this game are still two-dimensional, pre-rendered sprites. It was released for the Nintendo 64 and later became available for the Wii and Wii U's Virtual Console. The gameplay expands on that of its predecessor, Super Mario Kart. Players must steer with the Nintendo 64 controller's control stick, holding down to accelerate. is used for braking, and it also allows the players to reverse by pointing the control stick down. Items can be used by simply pressing the trigger. When players press the trigger, they hop, allowing the kart to turn around tight corners. While players are drifting, the control stick can be used to make the turn wider or tighter, but keeping the control stick in the opposite direction of the turn to widen it for a long enough time results in the kart skidding and losing the Mini-Turbo charge. If a Banana is hit while the player is driving straight, the character will skid for a while before spinning out. If the player presses the button, a musical note will appear over the character's head, therefore nullifying the effect of the item (this effect is also included in Mario Kart: Super Circuit). This does not work all the time, however, because sometimes, the player can skid out immediately after driving into a Banana if the Banana is hit while turning. Similarly, in 150cc and Mirror Mode, steering in one direction and then immediately in the opposite results in the kart skidding and then spinning after a short time, and even in this case, braking results in the spinning being avoided with the musical note appearing. As opposed to the previous game, a standard race now has three laps rather than five due to the much longer raceways compared to those found in Super Mario Kart. Additionally, the racetracks have elevation and feature different forms of terrain. To get items, the character must get an Item Box. Once the character gets an Item Box, an item roulette will appear with medium sound, and when it stops, it "dings." Players can press the item button during the roulette to stop the roulette early. Also, unlike in Super Mario Kart, players can now try again as many times as they wish after they finish in 5th or below (this was removed in later games for unknown reasons, though likely as a means of making the game more challenging for the player). The main mode of the game, Grand Prix involves racers racing one another in four cups, designated as Mushroom Cup, Flower Cup, Star Cup, and Special Cup, with four races in each cup. These cups are further divided into three different difficulty settings of 50cc, 100cc, and 150cc. An unlockable Extra, known as Mirror Mode, allows players to race courses in 150cc but flipped vertically, which sometimes increases difficulty. In order to unlock this feature, players must win the Gold Cup on all the cups in 150cc. When the title screen changes, it means that the player has unlocked Extra. Grand Prix can only be chosen during a one- or two-player mode. In Time Trial, players must race for the highest time. After setting a record, players can challenge that record and race against themselves, represented by a Ghost of their character-of-choice. Versus Mode involves two or more players racing each other on either a Grand Prix or selected racecourses of their choice. After the players finish a selected racecourse, a point is given to the first place winner as a sort of tally, and players can race again or select another course. There is no set number of races, and the points do not signify anything. When two or more players are racing together, Mini Bomb Karts will appear on the courses. In Battle Mode, each player starts with three balloons and loses a balloon when hit by any item. It is also possible to lose a balloon if a heavier player, such as Bowser, hits a lighter player, like Toad or Yoshi, with great enough speed (more details here). When a player has lost all balloons, the player loses and becomes a Bomb Kart. The last surviving player wins the round. The original release of this game on the Nintendo 64 used 123 pages of the Controller Pak to record Ghost Data, which would occupy all the space in the Controller Pak. However, later versions of the game used 121 pages on the Controller Pak, leaving only two pages free. If the player holds before turning on the console, there is a Controller Pak manager built-in the game, which will show all saves from other games that use the accessory. When the player holds while opening the iQue Player release, this does not appear. Because none of the available controllers have a Controller Pak Slot, it is impossible to record Ghost Data on the Wii or Wii U Virtual Console versions of the game. The rival system in this game is the more common 2 Rival system seen in most similar games, whereupon two randomly selected rivals will fight with the player and will use the "Handicap" feature to situate themselves on level with the player. They will always stay the same, no matter what the championship standings are. On a side note, when the player plays the 150cc or Mirror Mode, two random CPU racers may receive a huge handicap, and even when hit with an item such as a Red Shell, they will recover rapidly. Sometimes there is also one player that receives an even larger handicap, and when the player is ahead, it becomes very challenging for them to stop. The game uses rubberbanding AI, meaning that no matter what weight class, the AI drivers can recover and return to speed faster than the human player. Characters are divided into three classes depending on their weight: Light, Medium, and Heavy. * indicates that the character is a New Driver for the Mario Kart installments overall. Lightweight drivers have the highest acceleration and highest top speed. They receive the most speed from Mini-Turbos and lose the least amount of speed when turning or drifting. Additionally, only lightweights (and the heavyweight character Bowser) can use the triple-gas acceleration recovery technique (tapping the gas button three times and then holding to accelerate more quickly). The single downside to lightweight characters is that they can spin out from contact with heavier characters. Middleweight drivers actually have the slowest acceleration of all the weight classes and have the same top speed as the heavyweights. They do have better handling than heavyweights and are faster off-road, however. While they lose more speed when turning than the other weight classes, they can corner better if they are not drifting, which is more useful in Battle Mode. Heavyweight drivers have a slower acceleration than the lightweights but faster acceleration than the middleweights, and they share the same top speed as the middleweights. Their initial acceleration is the worst of all weight classes, but as they approach their top speed, they experience a burst in speed that lets them reach that speed more quickly than middleweights. They lose the most speed off-road, and their cornering capabilities without drifting are the same as lightweights. Analysis and Tiering of the above weight categories are demonstrated on this document. Additionally, players can drive a Mini Bomb Kart when all their balloons disappear in Battle Mode. The Mini Bomb Kart can drive around and explode on other players, but it only has one use for exploding before completely disappearing. Banshee Boardwalk A swarm of bats flies towards the racers, slowing them down if they drive directly into a member of the swarm. Moo Moo Farm Chubbies peak out of holes and then jump, posing as obstacles for the drivers. Rainbow Road Chainless Chomps that are embedded into the track, chomping around at random. If a racer collides with one, they will be launched into the air. Koopa Troopa Beach Crabs are stationed on the sand, spinning players out of control if driven into them. Sherbet Land Penguins are found either sliding or walking around an icicle. Both varieties will spin racers out of control if collided with. Mario Raceway Piranha Plants pose as obstacles on the racetracks, spinning drivers out of control for a brief moment. Yoshi Valley Porcupines walk from side to side, spinning out a racer that collides with them. Frappe Snowland Snowmen are situated on the track, launching the player into the air if they drive into them. Bowser's Castle Thwomps appear as enemies, performing their trademark slam attempt at the drivers below. Additionally, some Thwomps move from side to side on the ground. These Thwomps will laugh ominously at racers. Banshee Boardwalk In addition to being items in the game, Boos appear at certain parts of the race and make their trademark noises. These Boos are merely there and are not hazards or obstacles. Bowser's Castle Bowser Statues breathe continuous flames, having no impact on the racer. Banshee Boardwalk A Cheep Cheep jumps out of the water over the track. It makes no interaction with the racers. All courses Lakitu acts as the referee for the game, as well as fishing out racers that fall off the course or go out of bounds. Moo Moo Farm Moo Moos are abundant in the background of the track, only posing as onlookers. Choco Mountain Boulders fall from the edge of a mountain, flattening racers in their path. Kalimari Desert Cacti are stationary objects that cause the player to spin out of control when hit, similar to trees. D.K. 's Jungle Parkway Fruit are thrown at racers that go off-road, slowing them down until they return to the main track. Kalimari Desert Two trains circle around the course, sometimes passing through an intersection with the track. When this happens, all racers before the train must wait for it to pass, including CPU racers. Failure to wait will result in the racer being launched into the air multiple times. Toad's Turnpike Vehicles drive down certain lanes. If a racer collides with one, they will be knocked into the air. In Mirror Mode, the vehicles drive opposite of the player, making them harder to avoid. Yoshi Valley A giant Yoshi Egg that spins around, flattening any racer in its path. Mushroom Gives a racer a short speed boost. New Item Spawns three Mushrooms, providing the racer with three speed boosts. New Item Allows numerous speed boosts for a period of time. New Item An item that appears the same as a normal Item Box. When collided with, however, the racer will be launched instead of getting an item. Banana Drops a banana peel, making racers spin out when run over. New Item Summons five Bananas behind the racer. Green Shell A shell that can be thrown in a straight line at another racer. If it hits, the racer will spin out. New Item Summons three Green Shells into a barrier that surrounds the racer that used the item. The player can either throw each shell or use it as a shield to other items. Thrown shells have the same effect as Green Shells. Red Shell A shell that can be thrown at another racer, much like a green one. Unlike Green Shells, however, these will automatically lock on to the racer directly in front of the item user. New Item Summons three Red Shells into a barrier that surrounds the racer that used the item. The player can either throw each shell or use it as a shield to other items. Thrown shells have the same effect as Red Shells. New Item A shell that automatically follows and targets the racer in first place. Super Star Makes racers invincible, rendering them impervious to obstacles, other items, or other racers. Lightning When triggered, all racers except for the one that used the item will shrink, slowing them down and allowing them to be run over. Boo Unleashes Boo, who turns the player invisible for a brief time, making them impervious to enemy attacks, and steals an opponent's item. ★ - Can be used multiple times. × - Does not appear in the Battle Mode. The following chart is reported in the Nintendo Player's Guide of Mario Kart 64 and indicates the probability of obtaining a certain item with letter codes that range from A (frequently obtained item) to D (unobtainable item). 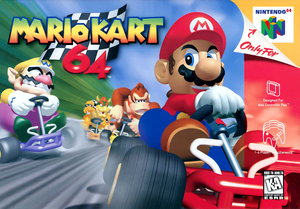 Super Mario Kart: The introduction music in Mario Kart 64 is an elongated remix of the theme from this game. In the music for the track Banshee Boardwalk, a part of Ghost Valley's music can be heard. Super Mario World 2: Yoshi's Island: Yoshi's sound effects were taken from this game. Super Mario 64: In the track Royal Raceway, there is a part where the racer can turn off the road and arrive at Princess Peach's Castle exactly as it appeared in this game. It is also where the awards ceremony is held. Donkey Kong Country: This is the first appearance of the Donkey Kong Country version of Donkey Kong in the main Mario franchise. In fact, the sprite resembles the one Donkey Kong had in that game. Yoshi's Story: Yoshi's design in this game is similar to the design and sprites used in Mario Kart 64. Mario Party and Mario Party 2: Luigi's, Peach's, Wario's, and Toad's voice clips from the Japanese version were reused in these games. Mario Kart: Super Circuit: Many graphics from this game were reused, such as characters, karts, and character screen portraits as well as Luigi's, Peach's, Wario's and Toad's voice clips from the Japanese version. A similar thing that while losing characters turn into a Mini Bomb Kart in Mario Kart 64, losing characters turn into Bob-ombs in Mario Kart: Super Circuit. Super Smash Bros. Melee: A Mario Kart 64-style kart is an unlockable trophy. Mario Kart: Double Dash!! : The name Sherbet Land is reused in this game. Also, Rainbow Road's music has a part from the Mario Kart 64 Rainbow Road's music. Mario Kart DS: The name Wario Stadium is reused in this game. Also, the courses Moo Moo Farm, Frappe Snowland, Choco Mountain, and Banshee Boardwalk and the battle stage Block Fort reappear in this game. Mario Kart Wii: The racecourse Moo Moo Meadows and battle stage Block Plaza are based off of Moo Moo Farm and Block Fort, respectively. Also, the courses Mario Raceway, Sherbet Land, DK's Jungle Parkway, and Bowser's Castle and the battle stage Skyscraper reappear in this game. New Super Mario Bros. Wii: A section of Rainbow Road's music is covered in World 9's music. Mario Kart 7: The courses Luigi Raceway, Koopa Troopa Beach, and Kalimari Desert and the battle stage Big Donut reappear in this game. The kart now called Pipe Frame returns in this game as a kart body, with the dual exhaust design instead of the single exhaust from Super Mario Kart. Some of the music tracks are covers or rearranged versions of themes from Mario Kart 64, like Rainbow Road. A part of Neo Bowser City's music contains segments from the course background music for Toad's Turnpike. Finally, Mario Kart 64's winning and losing results themes receive a cover version in Mario Kart 7. Mario Kart 8 / Mario Kart 8 Deluxe: Toad's Turnpike, Royal Raceway, Yoshi Valley, and Rainbow Road reappear in these two games. The unused split screen for multiplayer in this game is also used here. N64 Peer Schneider, IGN 8.1/10 "Although it doesn't break any new grounds in originality (like Mario 64), Mario Kart 64 is a great addition to the N64 line-up. The solid graphics, good sound, and addictive gameplay--coupled with features like being able to race yourself (from a former race) in a special ghost mode--make you want to play it forever. If you primarily race alone, Wave Race 64 would be the game of choice. Otherwise, Mario Kart 64 is a must-have. The only draw-back is that you'll be speaking with Italian accents before long... And now leta me go-e, I have an appointmente witha three verry, verry deade people.'" N64 Trent Ward, GameSpot 6.4/10 "If you own a Nintendo 64, you're probably going to buy this game whether or not you read and heed this review - after all, there aren't really a lot of N64 games to choose from, and it IS a Mario title. Fair enough. The thing is, even with all its bells and whistles, Mario Kart 64 is very likely to disappoint you after about a week. I wouldn't feel right about not giving you that warning. That said, I'm off to Mario Kart on my SNES to reminisce about the good old days, and dream of what this cartridge could have been." For a complete list of media for this subject, see List of Mario Kart 64 media. Kamek was originally intended to be one of the playable characters, but ended up being replaced by Donkey Kong. The Character Select screen was also different, the characters faced the player, and Kamek can be seen in Donkey Kong's space. The working title of this game was Super Mario Kart R. Boos from Banshee Boardwalk also had a different look, the HUD was different from the final version, and item boxes were also completely black with colored question marks on them. The Cape Feather, which was in Super Mario Kart, was also intended to be included, as seen in a certain screenshot of Super Mario Kart R. This particular screenshot can been seen on the back of the packaging of the Nintendo 64 system. This glitch works in any mode with any player on Wario Stadium. On the first hill after the start of the race, the player should drive into the wall, they should be able to bounce over it. Next, they should do a 180 degree turn and aim for the starting pole. The player then should hop over the wall again and make sure to land to the right of the starting line. Once the player crosses the starting line after they regain control of their kart, Lakitu should hold the second or Final lap sign, depending on which lap the player was on previously, or he will wave the checkered flag, if the race is finished. The same trick can also be performed on Choco Mountain. By driving straight toward the gray wall just before the loop with the falling boulders, and jumping just as the player hits it, they can clear the wall. The guard rail in 50cc and Time Trials only has single-sided collision detection. Alternatively, players can also simply drift into the wall and jump as they hit it to clear it. To perform this glitch start a battle on Double Deck. The player must then park one of the characters over an Item Box and make sure that the character doesn't receive a Boo or Star. Then have the other character(s) lose their balloons. On the Battle Ranking screen, keep pressing on the controller for the character that is on the item box. Eventually the game will freeze with the music still playing. In the Japanese version, Luigi, Toad, Princess Peach, and Wario have different voiceovers than in the Western localization; the Japanese voiceovers were eventually used overseas in the first two Mario Party games and Mario Kart: Super Circuit. Also, Toad, Donkey Kong, and Bowser are referred to as Kinopio, D. Kong, and Koopa, respectively. Additionally, the system voice is a generic narrator in Japan, while the North American and European releases used Mario as the system voice. "Raceways" are known as "Circuits" in the Japanese version ("Mario Circuit", etc. ); however, "Royal Raceway" is known in Japan as "Peach Circuit" instead of "Royal Circuit." Also, the billboards in the Japanese version use parodies of real-life companies which were sponsors of Formula One races at the time; these were changed during localization for legal clearing reasons. These include Marioro (a play on Marlboro), which was changed to "Mario Star"; Luigip (a play on Agip), which became "Luigi's"; Yoshi 1 (a pun on Mobil 1), which became "Yoshi" with a pawprint replacing the "1"; Koopa Air (which parodied Goodyear, including the blue-and-yellow color scheme, which was changed in international versions); and an orange 64 ball (which was a reference to the 76 gas station chain, though the ball's color was changed to blue in the Western versions). 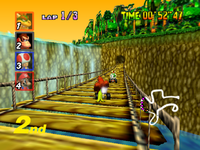 The Japanese version has collision on the grass above the tunnel on Luigi Raceway, which can be reached by bouncing off another racer and flying over the wall; this was removed in international versions. Also, whereas English-language credits sequences exist in both the Japanese and Western ROMs, for some reason, the Japanese ROM also contains a Japanese-language version of the sequence that is seen when a player clears the Special Cup in 150cc. In the Chinese version, the Special Cup was renamed to the iQue Cup, and most '64' references were removed. For this subject's image gallery, see Gallery:Mario Kart 64. Toad and Mario battle while trying to avoid a Mini Bomb Kart. This is the one of two Mario Kart games to have the Special Cup available right from the start, the other being Mario Kart 8 Deluxe. If more than two players are playing in VS. and Battle Modes, the background music will not play on any course, due to the 3D vertex and sound processing working on the same DSP of Nintendo 64's specifications. The lightning effect was changed in release on the Virtual Console to a less intense flash, most likely to prevent seizures. This page was last edited on April 15, 2019, at 22:41.